SMARThome.eu :: How to build KNX electrical cabinet? SMARThome.eu / Offer / Guidebooks / How to build KNX electrical cabinet? How to build KNX electrical cabinet? How to build an electric switch cabinet for the KNX/EIB system? What are the methods of assembly of equipment in the cabinet? Installation specialists and smart home system designers often seek answers to these and many similar questions regarding the design and implementation of KNX/EIB systems. Browsing hundreds of pages of general material is time-consuming and ineffective. This, however, can be avoided. We will guide you step by step through the process of assembly and equipping of large electric switch cabinets. We will also remind you what you need to remember about, and what should be handled with the most care. The guide is designed to help you in situations which installation specialists and designers encounter when executing smart systems. Numerous examples show typical or particularly recommended solutions. Thanks to them you will quickly be able to evaluate which actions will be best in a given case. The guide is supplemented by many diagrams and illustrations, the analysis of which will help you implement practically the described examples. Even up to 25 000 EUR – this is its value after you have taken a few orders for the execution of complete KNX/EIB switch cabinets. 67 EUR – this is the estimated value of printed material from the training seminar. 47 EUR – you only pay this much when buying our guide 'How to build an electric switch cabinet for the KNX/EIB system?' gaining access to this material any time and anywhere! Now you can have all the most important information always at hand. Trust over 12 years of experience of SMARTech specialists. Order your guide 'How to build an electric switch cabinet for the KNX/EIB system?' today for the special price of 47 EUR (the price rises with each new addition, present customers will receive all future updates, so it's worth buying quickly for a lower price). Bonus 2: A general guide to 14 smart home systems available in Europe, with a table comparing their 36 features in detail. A few days ago I had decided to purchase one of the guidebooks offered by the website SMARThome.eu. As a freshly promoted engineer who is just starting his adventure with smart systems, I had decided to confront my knowledge on construction of switch cabinets, with the contents of the guide 'How to build an electric switch cabinet for the KNX system'. I was expecting a very technical approach to the matter, but was totally surprised. Instead of technical babble I found simple tips, complicated and often illegible diagrams were replaced with clear drawings and photographs from actual projects, and at the end of the guide - a complete set of document templates for control checks and commissioning. After having read this guide I had only one thought - if the textbooks used during studies were written like this guide, one could have learned a lot more. Don't waste time by searching for information - order your guide 'How to build an electrical switch cabinet for the KNX/EIB system? ', and receive the free special report 'Which KNX/EIB system to choose?' Make use of valuable tips gathered by professionals! 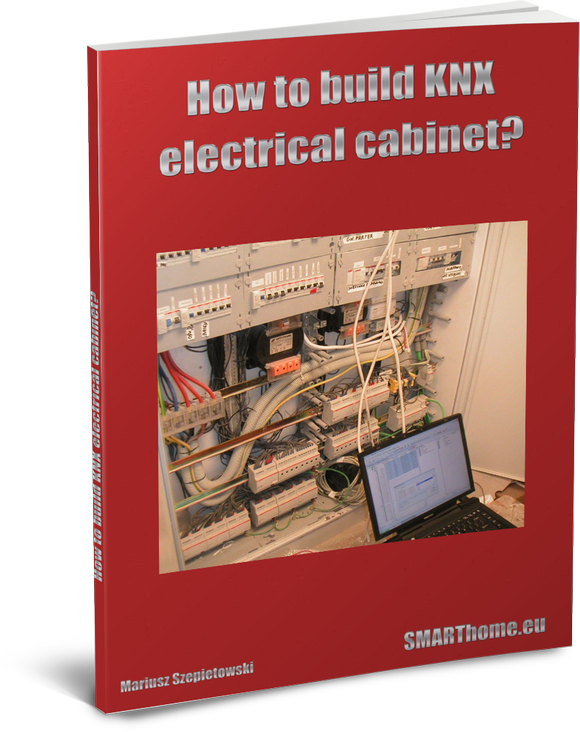 Yes, I want to order the e-book: How to build an electrical switch cabinet for the KNX/EIB system? for the gross price of 47 EUR. Over 200 pages of information and tips for installation specialists and constructors of electric switch cabinets for the KNX/EIB system.